Jacob Daniel McGee (born August 6, 1986) is an American professional baseball pitcher for the Colorado Rockies of Major League Baseball (MLB). He previously played for the Tampa Bay Rays. McGee was born in San Jose, California. He grew up in Sparks, Nevada, where he attended Edward C. Reed High School. McGee was selected by Tampa Bay Devil Rays in the fifth round (135th overall) of the 2004 Major League Baseball Draft. McGee made his minor league debut in 2004, and spent 2004 and 2005 with the Princeton Devil Rays and the Hudson Valley Renegades. 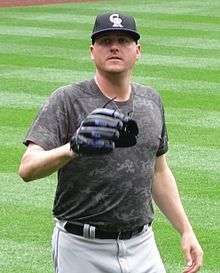 In 2006, McGee spent the year with the Southwest Michigan Devil Rays. He played with both the Vero Beach Devil Rays and the Montgomery Biscuits in 2007. he spent the entire 2008 with the Montgomery Biscuits, going 6–4 with 3.94 ERA. McGee was rated by Baseball America as the third-best organizational prospect for Tampa Bay Rays and 15th overall MLB prospect in 2008. In 2007, he was ranked 5th in the Rays' organization and 37th overall in all of baseball. McGee is nicknamed "Clockhands". He earned the nickname due to his unconventional windup. McGee had Tommy John surgery on July 8, 2008. McGee was promoted to the major leagues for the first time on September 14, 2010. He made his major league debut that night against the New York Yankees, walking three batters and striking out Derek Jeter for his first major league strikeout. McGee made the Rays MLB roster after spring training in 2011, but he was sent down to the team's Class AAA minor league affiliate after 11 appearances. In the last few months of the 2014 season, McGee became the Rays' closer. He finished the season with 19 saves. After undergoing elbow surgery to remove "loose bodies" in December 2014, McGee spent the early portion of the 2015 season with the Class AAA Durham Bulls. He underwent knee surgery for a torn meniscus in late August, ending his season. On January 28, 2016, McGee and Germán Márquez were traded to the Colorado Rockies for Corey Dickerson and Kevin Padlo. McGee and the Rockies avoided salary arbitration on December 3, 2016, by agreeing to a $5.9 million contract for the 2017 season. Jake and Morgan McGee have been married since December 2009. As of late 2015, they live in Tampa, Florida. For the last several years, the couple has purchased Christmas presents for foster children in Reno and Tampa. ↑ "Top Prospects: Player Profile". Web.minorleaguebaseball.com. Retrieved September 14, 2010. ↑ "Jake McGee Pitching Statistics". The Baseball Cube. Retrieved September 14, 2010. ↑ Ballew, Bill (November 12, 2008). "Prospects: Rankings: Organization Top 10 Prospects: Tampa Bay Rays: Top 10 Prospects". BaseballAmerica.com. Retrieved September 14, 2010. ↑ Kaufman, King; Tan, Cecilia, eds. (2012). Baseball Prospectus 2012. John Wiley & Sons. p. 464. ISBN 1118197690. Retrieved March 12, 2016. ↑ Montgomery, William (July 17, 2011). "Rays recall former Renegade McGee from Triple-A". Times Herald-Record. Retrieved March 12, 2016. ↑ "Rays' Percival fumes over catwalk-aided double – St. Petersburg Times". Tampabay.com. Retrieved September 14, 2010. ↑ Associated, The (September 14, 2010). "The Canadian Press: Rays call up lefty Jake McGee, send right-hander Mike Ekstrom to minors". Google.com. Retrieved September 14, 2010. ↑ Little, Josh (May 2, 2011). "Jake McGee sent down to Triple-A". KOLO-TV. Retrieved March 12, 2016. ↑ Chastain, Bill (May 6, 2015). "McGee could return to 'pen during homestand". MLB.com. Retrieved March 12, 2016. ↑ Gleeman, Aaron (August 20, 2015). "Rays reliever Jake McGee undergoes season-ending knee surgery". NBC Sports. Retrieved March 12, 2016. ↑ Harding, Thomas (January 28, 2016). "Rockies to receive reliever McGee in four-player swap". MLB.com. Retrieved January 28, 2016. ↑ Adams, Steve; Todd, Jeff (December 3, 2016). "Players Avoiding Arbitration: Friday". mlbtraderumors.com. Retrieved December 3, 2016. ↑ Mooney, Roger (December 24, 2015). "Rays' McGee, wife celebrate anniversary by spreading Christmas spirit". The Tampa Tribune. Retrieved March 12, 2016. Wikimedia Commons has media related to Jacob McGee.